This article contains the stats, strategy, and guide for Caster - Gilgamesh. We will update this as soon as the game comes out. Divinity B Increases own damage by 175. King’s Return A 3 9 Increases Party’s critical stars generation for 3 turns. Charisma A+ 3 7 Increases party’s attack for 3 turns. Sovereign of Magic Wands EX 3 8 Increases party’s arts card performance and Debuff success rate for 3 turns. Deals damage to all enemies. Increases Party’s defense up by 20% for 3 turns. Reduces enemies’ defense for 3 turns. 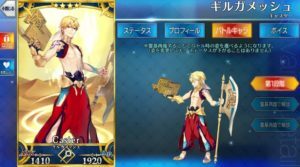 Gilgamesh, Lord of Uruk and the renowned King of Heroes, stands at the pinnacle of all Archer class heroes. Since he existed before many of the heroes, many say that he has all the original noble phantasms. Because of this, he sometimes tends to tell other heroes that he’s just claiming back what’s his. Unfortunately, Gilgamesh can be quite thick-headed and annoying. He objectifies people and has a complete infatuation for Saber. In the previous Fate installments, Gilgamesh initially served Tohsaka Tokiomi and then Kotomine Kirei. When he speaks, he often uses the term “ore” or “ware”. In some literatures, Gilgamesh appears less haughty and more wise. When going through his Epic, he actually has a companion. This companion is named Enkidu who he taught how to speak. Since then, their bond had become so strong that it even drew Ishtar’s jealousy.